Picture retrieved from erowid.org on August 24th, 2013. Poetic testimonials to opium – especially by 19th century writers – have typically been used to defend opium use. When such brilliant minds as ben franklin and Thomas De Quincey use opium, the argument goes, isn't it obvious that it is harmless? 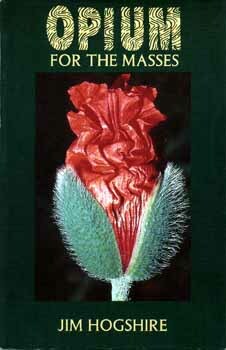 Drug-use promoters of the 1960's, especially, seemed to constantly thump the cover of a copy of De Quincey's Confessions of an Opium Eater while making the case for marijuana. Mention of these famous Victorian era authors and their use of opium has become mandatory when discussing drug use. But this is not a book about marijuana and it is not about heroin. Neither one is like opium. Even though heroin is an opiate (opium-derived) it is pharmacologically distinct. Later incarnations of the morphine molecule are even less like opium. Opium addiction – as we now define it – played no part in the lives of opium users before the 20th century. Even as society began to criminalize opium and heap scorn on it's user, the word “addict” was not used. At the time, doctors spoke of “habitues” - and without alarm. And why should they? Opium does not cause any harm to the body. Opium users still got up in the morning and went to work, had families, and paid their bills. What was there to be upset about?